Erica Meijers is a journalist and a theologian. She works at the Protestant Theological University in Groningen, the Netherlands. 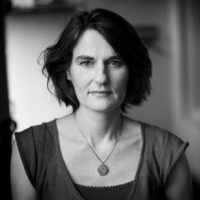 Until 2017 she was a member of the editorial board of the Green European Journal and editor-in-chief of de Helling, review of the political foundation of the Dutch Greens. In 2016 she published with Nuala Ahern the book Green Values, Religion and Secularism, edited in cooperation with the Green European Foundation. Big data: omnipresent but mostly invisible. How can politics catch up with Silicon Valley and get a grip on our information? Ton Lemaire pleads for a new universal morality, which he calls humanimalism. Od przestrzeni aktywności ekonomicznej po parki rozrywki dla turystów? Co się dzieje . From centres of economic activity to amusement parks for tourists, what is happening to our cities and what space is left for their citizens? Erica Meijers unpacks the concept of 'the people' at the heart of populist movement's message, and argues that a look at its theological roots can help to understand and subvert it. On a sunny terrace on the borders of the river Oder, which flows between Germany and Poland, a small group of activists, journalists and politicians from different European countries decided in the late summer of 2011 to start a new magazine that would contribute to building a European public space and at the same time empower the Green movement. Willen linkse partijen uit het electorale en ideologische slop komen, dan moeten ze terug naar hun bronnen. Linkse partijen zullen de huidige economische en politieke orde opnieuw moeten interpreteren, willen ze haar kunnen veranderen. Inequality is back on the agenda. French economist Thomas Piketty has drawn attention to it again with his book Capital in the Twenty-First Century, and that is a good thing. Green and Left-wing parties are drooling over the book, but I have heard few suggestions as to how we should fundamentally tackle that inequality. To do that, we need an idea from a completely different world. Historie I wojny światowej ograniczają się najczęściej do poszczególnych, narodowych perspektyw. Wojna z lat 1914-1918, która kosztowała życie sporej części europejskiej populacji i na trwałe naznaczyła tych, którzy ją przetrwali, rzadko kiedy bywa wspólnie upamiętniana. Nadszedł czas, by to zmienić. Stories about the Great War are usually confined to a national perspective. The war of 1914-918, which decimated a whole generation of Europe’s population and marked those who survived for life, is hardly ever commemorated jointly. This ought to change. Nelson Mandela personified the anti-apartheid movement in South Africa and became a worldwide symbol of hope in the face of discrimination. Although apartheid was ended, racism and discrimination still remain present in our society, and that needs to be remembered. Now that Merkel has triumphed in the German elections, one of the opposition’s main aims - the establishment of a national minimum wage - is likely to miss the boat and be left behind. Prospects are bleak for the growing numbers of working poor. In the Netherlands, one organisation is making a breakthrough in encouraging a better relationship between people and food. The secret – start young. An interview with Esther Boukema by Erica Meijers. In een Libanees eethuisje in Bazel heb ik een gesprek met Christoph Keller, een Zwitserse journalist en schrijver. Ons onderwerp: wat maakt ons tot Europeanen? The European Project lacks any significant ingredient of emotional bonding. In the absence of a “European soul”, the existing rational, bureaucratic structure is doomed to remain a distant presence for the citizens of Europe. Where Would We Be Without Barbarians? “Barbarians” still provide us with a way out of our own frustrations, identity-conflicts and forbidden feelings.